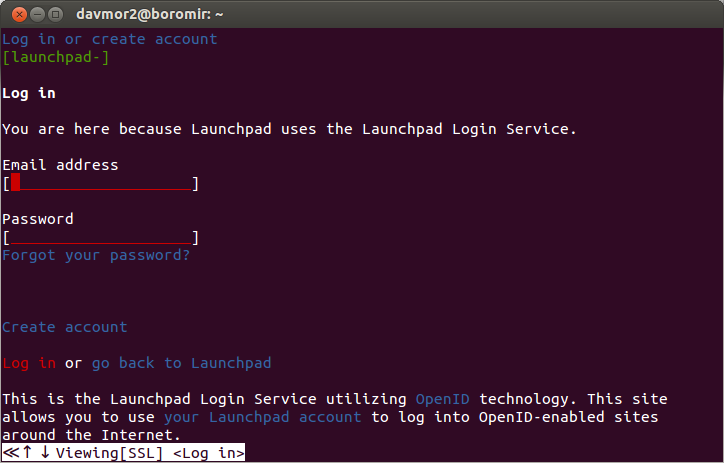 You are here because Launchpad uses the Launchpad Login Service. Where the field for 'Email address' is missing. This was working at some point, so this seems like a regression. This seems to be fine for me on Raring. Can I check what version of Ubuntu you are running. This is http://bugs.debian.org/cgi-bin/bugreport.cgi?bug=615843, fixed in quantal but not in precise. We should probably SRU this. I've uploaded an SRU for precise with the Debian patch linked above, awaiting review. Dave: It's up to you whether you want to keep this open on canonical-identity-provider. Using <input type="text"> rather than <input type="email"> would work around this, but that's probably deep in the guts of Django somewhere and presumably there's a reason it's using an HTML5-specific value for <input type> here. I suppose it depends on whether any other browsers we care about have this problem. I'd say fix released it's been working fine for a while now. > I'd say fix released it's been working fine for a while now. Meh indeed. Testing on precise confirms the issue. Sorry for the bug noise everyone. Accepted w3m into precise-proposed. The package will build now and be available at http://launchpad.net/ubuntu/+source/w3m/0.5.3-5ubuntu1.1 in a few hours, and then in the -proposed repository.